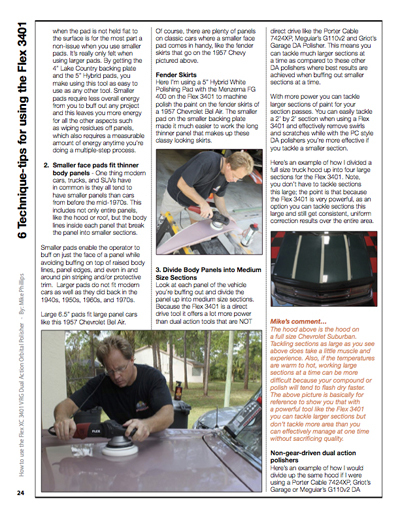 The most in-depth source of information available for the FLEX XC3401 VRG Dual Action Polisher! 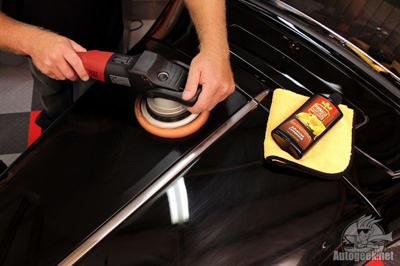 In the How to use the Flex XC3401 VRG Dual Action Orbital Polisher book, Mike Phillips provides an in-depth look at the lean, mean, German-made paint correction machine known as the FLEX XC3401. Perfecting your technique with this forced-rotation, dual action polisher will enable you to achieve the highest level of paint perfection. The information in this book caters to everyone from the at-home enthusiast to the full-time pro. Learn how to master the FLEX XC3401 VRG! Mike Phillips shares his own tips and techniques on how to achieve the highest level of paint perfection from the XC3401. From a comprehensive break-down of every pad and accessory available for this German built machine, to all the polishes and compounds that work best with it, Mike Phillips has created what can only be considered the definitive guide to the XC3401. Until this point nobody else has gone to the extent that Mike has to cover every minute detail about this lean, mean, paint correcting machine! ….and a whole lot more! Modern clear coats must be handled with care. It takes the right pads, products, and techniques to achieve the perfect finish. Mike covers all of the above so you can achieve perfection with your FLEX XC3401 the first time! Mike’s been detailing cars and teaching others how to detail cars his entire life. His passion for the craft shines through on each page thanks to his clear and concise writing style. Plus, you can access Mike and ask him any questions you have for your specific detailing projects at the AutogeekOnline.net discussion forum. Learn how to master the most powerful dual action polisher to create a stunning, show-car finish in your garage with the How to use the Flex XC3401 VRG Dual Action Orbital Polisher book. I really like the in broth information Mike has put into the book. I just recently started switching all of my equipment to Flex products. l appreciate the overall in-depth knowledge of this book. It helps me to appreciate this product even more. Wow! Lots of good information. I own a couple of videos and books from Mike and they're all like a detailer's bible for me. He presents a great technique as well as very useful information. Some of it is very in-depth which I think would apply to a professional detailer, but might be information overkill to a novice. This book is the latest in what I've come to expect from Mike's expertise and is instrumental for me as I transition from my trusty Porter-Cable to my new Flex polisher. ProsVery thoughtful and detailed. Each procedure is broken down and easy to follow as well as an explanation of PROPER technique. Definitely a must if you love to detail your car and tend to be a bit of an obsessive perfectionist. ConsSome information presented is a bit much for a weekend or occasional detailer, but still very helpful.